This tutorial is tailored for anvi’o v5 or later. You can learn the version of your installation by typing anvi-interactive -v. If you have an older version, some things will not work the way they should. Investigate the genomic heterogeneity in the context of predicted protein structures. All of these sections use the same publicly available metagenomic dataset generated by Sharon et al. (2013), which contains 11 feacal samples from a premature infant collected between Day 15 and Day 24 of her life in a time-series manner. After downloading raw sequencing reads, we co-assembled all samples and processed the resulting contigs longer than 1K using anvi’o following the anvi’o metagenomic workflow. 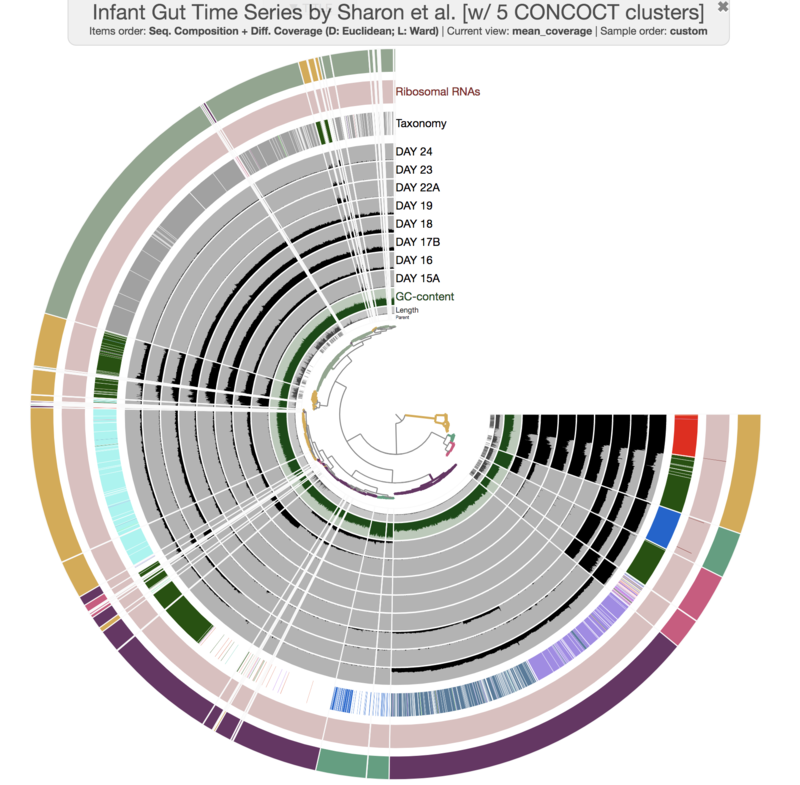 The main reason we chose this dataset was its simplicity: more than 95% of metagenomic reads map back to the contigs, a great indication of the assembled contigs describe a very large fraction of this infant’s gut microbiome. We hope you find the tutorial useful, and generously share your opinions or criticism should you have any. Alternatively (i.e., if you don’t have wget installed on your system), you can download the same file using this this link: https://ndownloader.figshare.com/files/12898007. If you type ls in the dataset directory you will see that the datapack contains an anvi’o contigs database, an anvi’o merged profile database (that describes 11 metagenomes), and other additional data that are required by various sections in this tutorial. Here are some simple descriptions for some of these files, and how we generated them. 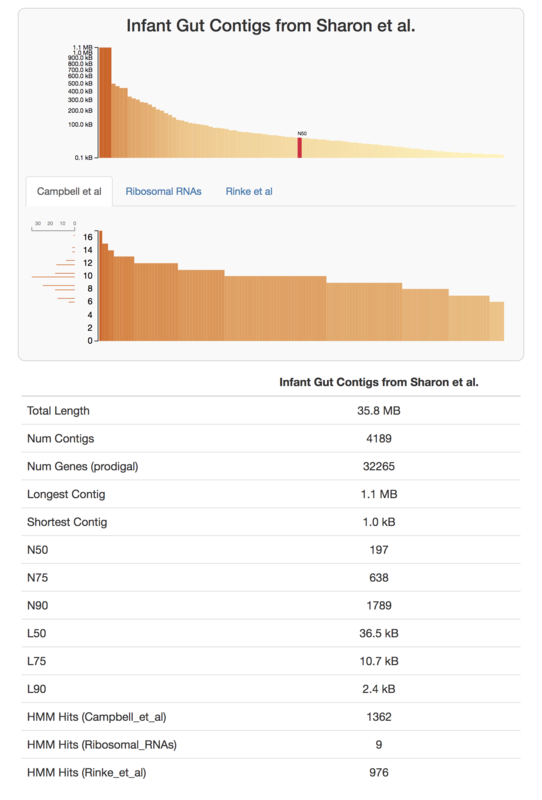 Identifying single-copy core genes among contigs. We used the program anvi-run-hmms to identify single-copy core genes for Bacteria, Archaea, Eukarya, as well as sequences for ribosomal RNAs among the IGD contigs. All of these results are also stored in the contigs database. This information allows us to learn the completion and redundancy estimates of newly identified bins in the interactive interface, on the fly. Note that if all single copy-core genes for a given domain are detected once in the selected bin, then the completion will be 100% and the redundancy 0%. If a few genes are detected multiple times, the redundancy value will increase. 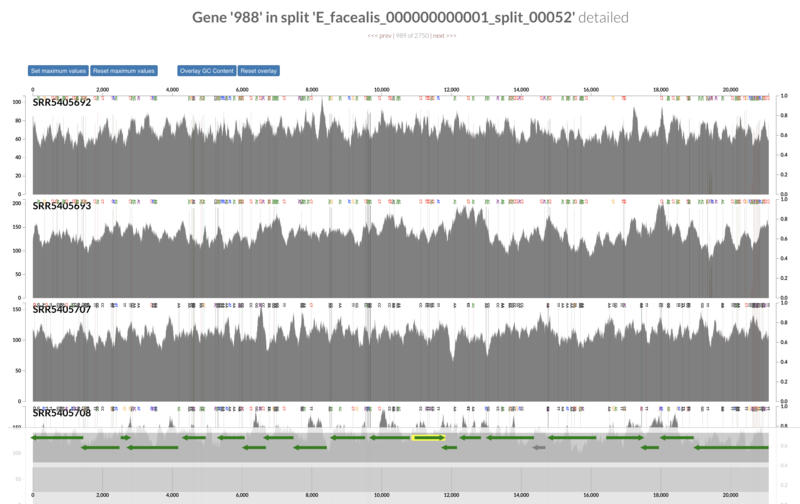 If a few genes are missing, then it is the completion value that will drop. Assigning functions to genes. We also run anvi-run-ncbi-cogs on the contigs database before we packaged it for you, which stores functional hits for genes results in the contigs database. At the end of the binning process, functions occurring in each bin will be made available for downstream analyses. 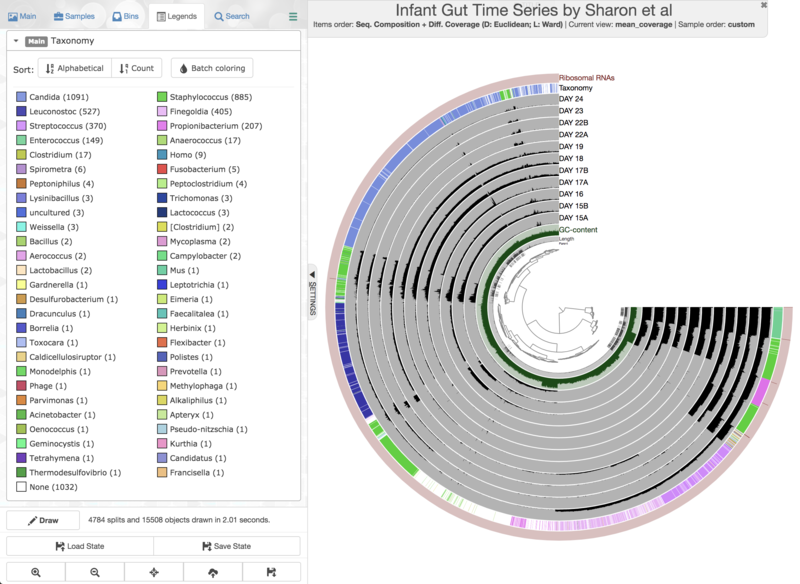 The purpose of this tutorial is to have a conversation about genome-resolved metagenomics (with a focus on manual binning) using the Infant Gut Dataset (IGD), which was generated, analyzed, and published by Sharon et al. (2013), and was re-analyzed in the anvi’o methods paper. By the end of this tutorial, you should (1) have a comprehensive understanding of genome-resolved metagenomics, and (2) be able to characterize and manually curate genomes from your own assembly outputs moving forwards. A typical anvi’o genome-resolved metagenomic workflow starts with one or more BAM files and a FASTA file of your contigs. 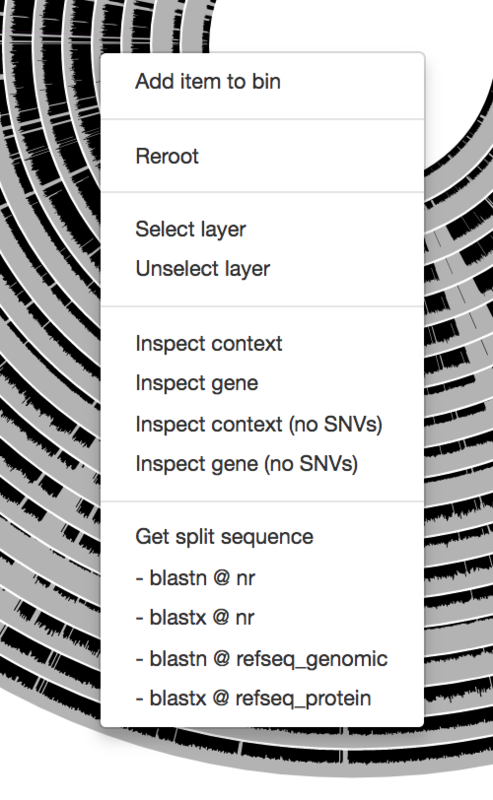 There are many ways to get your contigs and BAM files for your metagenomes and we have started implementing a tutorial that describes the workflows we often use. But in this tutorial we will start from a point in the workflow where you have used your BAM and FASTA files to generate anvi’o contigs and profile databases. 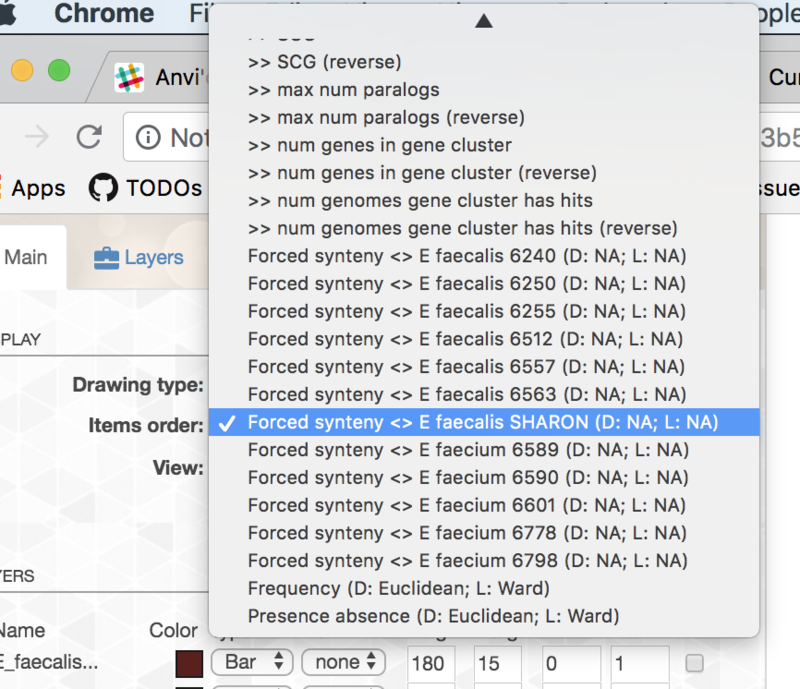 While this tutorial will take you through a simple analysis of a real dataset, there also is available a more comprehensive (but more abstract) tutorial on anvi’o metagenomic workflow. When it is time to type other commands, you can close the window, go back to the terminal and press CTRL + C to kill the server. The interactive interface of anvi’o can be quite overwhelming. 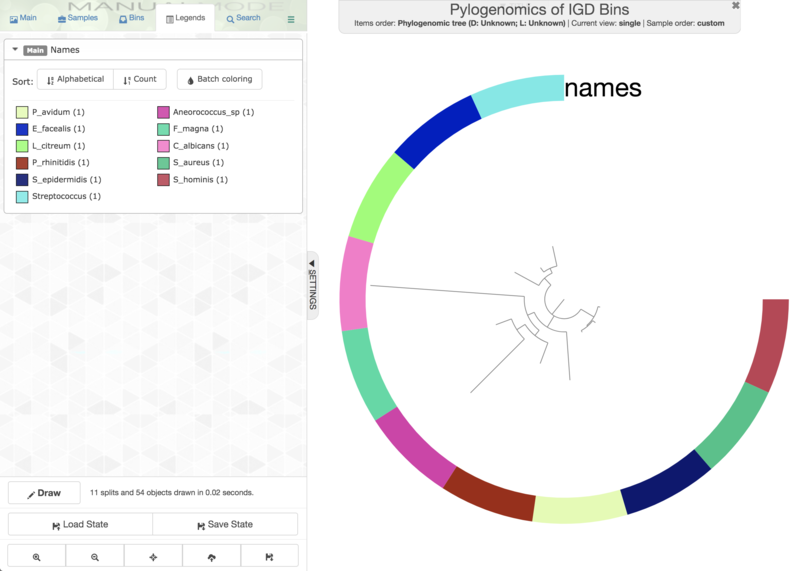 This particular box, in addition to the interactive interface tutorial, attempts to give you insights into the features of the interactive interface relevant to metagenomic binning. First of all, each leaf in the cerntral dendrogram describes an individual contig. Contigs that were fragmented into multiple splits due to their extensive length can be identified in the Parent layer. 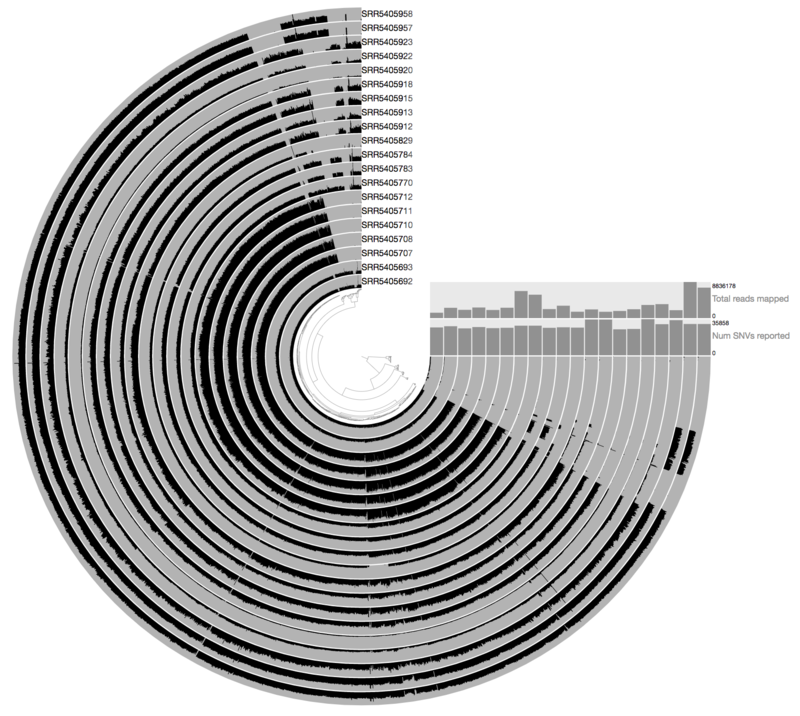 The grey layers after the GC-Content display mean coverage values (i.e., the environmental signal) of each contig/split across the 11 metagenomes. Finally, you can click on the MOUSE box on the right side of the interface to explore numerical and alphabetic values in more details across the display. Make contig selections by hovering your mouse over the tree in the center of the anvi’o figure. To add the highlighted selection to your current bin, left click. To remove the highlighted selection from your current bin, right click. To create a new bin, click “New bin” under the Bins tab in Settings. To change to a different bin, click the blue dot next to the bin name you’re interested in. Differential coverage: clustering based on the differential coverage of contigs across metagenomes. The logic behind this metric is that fragments originating from the same genome should have the same distribution patterns, often different from other genomes. Sequence composition: clustering based on the sequence composition of contigs (by default their tetra-nucleotide frequency). This might seem strange (and in fact, it is to many of us), but fragments originating from the same genome have the tendency to exhibit a similar sequence composition, often different from genomes corresponding to distant lineages. Differential coverage and sequence composition: clustering using the two metrics for optimal binning resolution. Anvi’o by default trusts the assembly; therefore splits from the same contig will remain together (but you can breakup contigs through the interface). Your selections will not be lost when switching from one organization to another. This particular ability has been very useful to visualize differences between clustering strategies and access the biological relevance of identified bins. 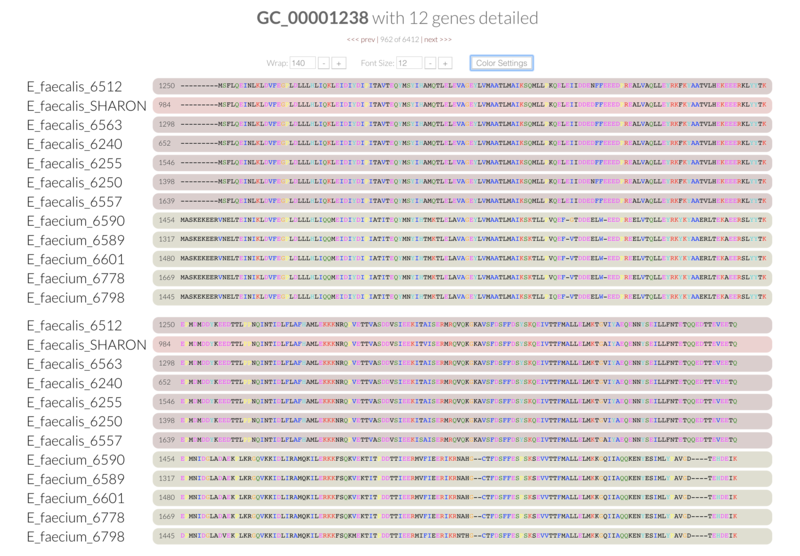 Note that gene coordinates are displayed at the bottom and their inferred function can be accessed in a simple click. 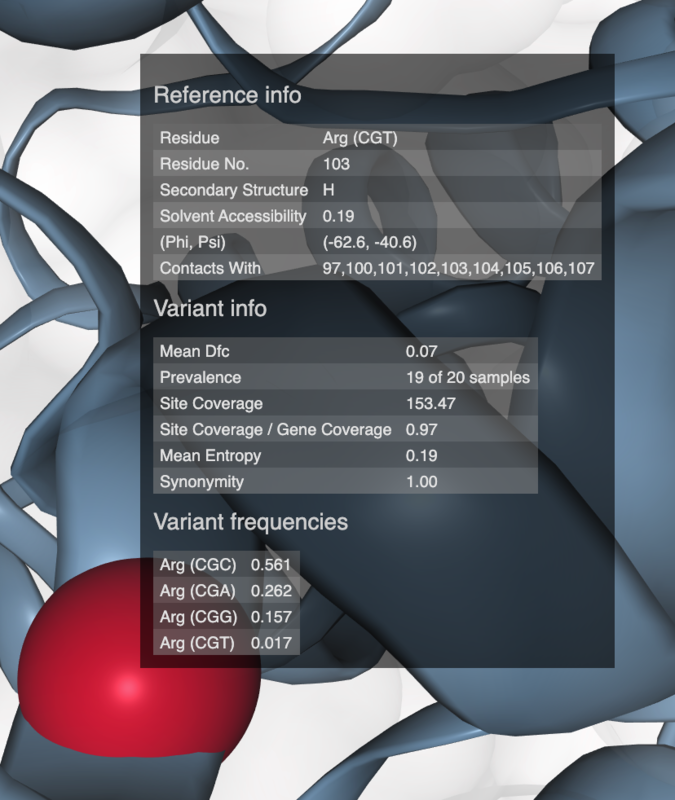 When detected, single nucleotide variants are also described in this display (vertical bars). You can close the inspection mode window when your curiosity has been satisfied. The taxonomic signal of contigs can be used to improve binning efforts. 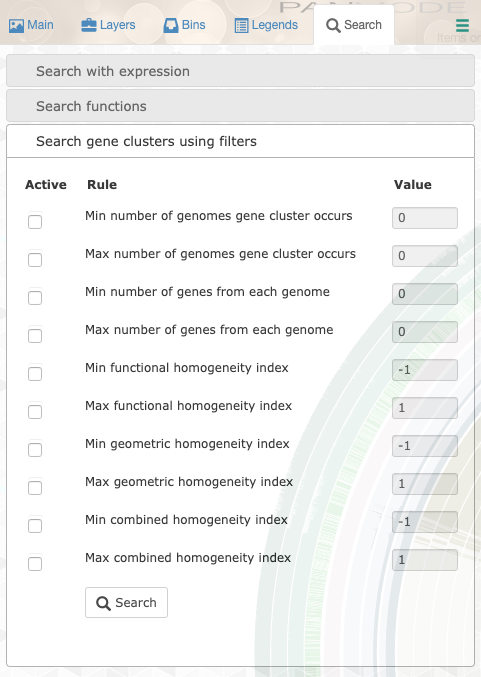 Once gene-level taxonomy is added into the contigs database, anvi’o will determine the taxonomy of contigs from these hits and display them in the interface. Centrifuge (code, pre-print) is one of the options to import taxonomic annotations into an anvi’o contigs database. Centrifuge files for the IGD are already in the directory additional-files/centrifuge-files. In the Layers tab find the Taxonomy layer, set its height to 200, then drag the layer in between DAY24 and hmms_Ribosomal_RNAs, and click Draw again. Then click Save State button, and overwrite the default state. This will make sure anvi’o remembers to make the height of that layer 200px the next time you run the interactive interface! While this is not relevant to genome-resolved metagenomics, we also determined the relative distribution of taxa across metagenomes at the short read level using KrakenHLL. 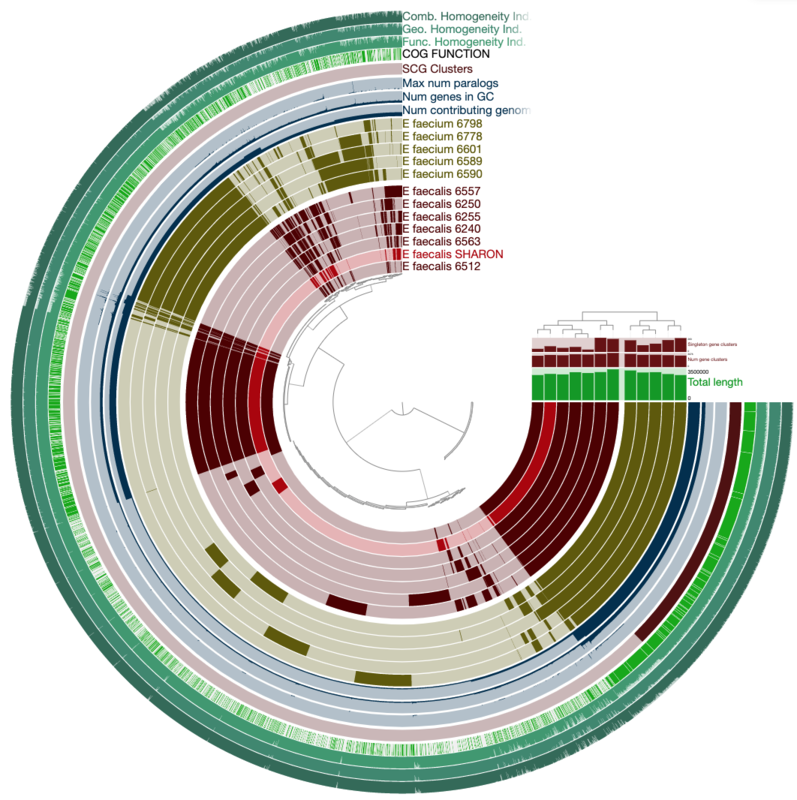 Such metagenome-centric information can be displayed as a layer in the interface using settings of the Layers tab. The Enterococcus bin was a nice catch, but it represents only a small fraction of the assembly. In other words, there is a lot more to discover in this dataset. At this point, you should be ready to do the actual manual binning, don’t you think? Let’s perform the binning effort clockwise starting from the Enterococcus bin described earlier. This should take about 10 minutes. This might be the most important part of the tutorial, so take you time and think. You do not have to bin all contigs. Instead, try to identify bins corresponding to an actual genome. Those will have relatively high completion values. The low-completion bins might represent interesting viruses and other genetic elements, but will be overlooked in this tutorial. Please try to avoid bins with redundancy >10%. Those likely contain contaminants. Please save your binning effort as default in the Bins tab (click on the store bin collection box). In the anvi’o lingo, a ‘collection’ is something that describes one or more bins, each of which describe one or more contigs. If you identified near-complete genomes, then congrats, you have characterized the genomic content of microbial populations de novo. If you found the eukaryotic bin, then well done. You entered a very small list of people who managed to reconstruct eukaryotic genomes from metagenomics! Now that our binning collection is saved (Id: default), it is possible to summarize the results directly from the interface in the Bins tab using the generate a static summary page box. When summary is completed, a link appears in the interface. It opens a window in your browser describing the binning outcomes and some relevant statistics. Take a minute to explore it. Data summarized in the window is linked to a newly created folder called SUMMARY_default, which contains basic information regarding each bin. It includes the fasta files, distribution patterns, completion metrics, and more. Feel free to explore files stored for one or two of your favorite bins. With those settings, a new collection MAG will be created in which (1) bins with a completion >70% are identified as MAGs (stands for Metagenome-Assembled Genome), (2) and bins and MAGs are attached the prefix IGD and renamed based on the difference between completion and redundancy. You can now visualize the results by double-clicking on the index.html file present in the newly created folder SUMMARY_MAGs. Ok. Now the interactive interface only displays contigs from the bin under scrutiny. During this curation step, it is suitable to look at each of the three clustering strategies to identify outliers, that is, putative contaminants to remove from the bin. If you identify putative contaminants, select only the contigs you wish to keep, and click in the Store refined bins in the database box of the Bins tab. This will modify the MAGs collection accordingly to your changes. It was not that hard, right? While we prefer manual binning over automatic binning for the sake of accuracy and comprehesnive control over our data, automatic binning is an unavoidable need due to performance limitations associated with manual binning. 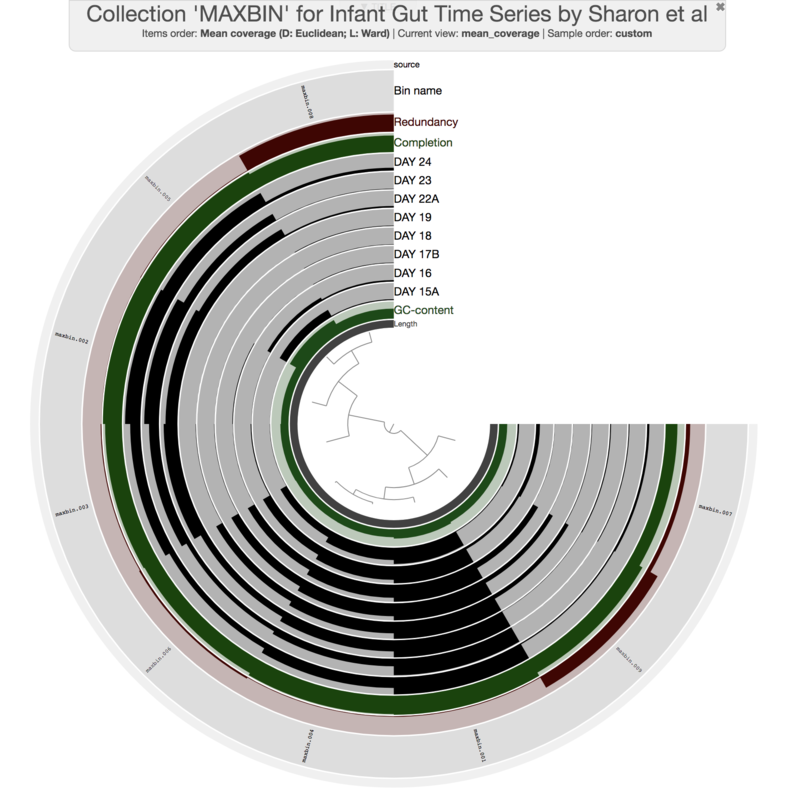 The actual purpose of this chapter is to talk about automatic binning, by comparing multiple binning approaches on the simplest real-world gut metagenome there is: the infant gut dataset. However, while we are going throughthis, you will also learn about how to incorporate automatic binning results into anvi’o. The directory additional-files/external-binning-results contains a number of files that describe the binning of contigs in the IGD based on various automatic and manual approaches. These files are GROOPM.txt, MAXBIN.txt, METABAT.txt, BINSANITY_REFINE.txt, MYCC.txt, CONCOCT.txt (those are popular automatic binning approaches), SHARON_et_al.txt (this is the manual binning from the original study), and MEREN_et_al.txt (this is the manual binning performed in the anvi’o paper). # MetaBat v0.26.3 (used jgi_summarize_bam_contig_depths to get a depth file from BAM files). CONCOCT results come from the CONCOCT module embedded within anvi’o. Eren et al results come directly from the collection generated during the study. Finally, a file corresponding to Sharon et al. results was created by BLAST-searching sequences in bins identified by the authors of the study (see http://ggkbase.berkeley.edu/carrol) to our contigs to have matching names for our assembly. Now you have the background information about where these files are coming from. Moving on. Alternatively you could load the interface without the --collection-autoload flag, and click Bins > Load bin collection > CONCOCT > Load to load the CONCOCT collection. So this is how you load and display an external collection. So far so good. Since we have all these results from different binning approaches, it clearly would have been interesting to compare them to each other (because benchmarking stuff is often very insightful). But how to do it? The simplest way to do it is to assume a ‘true organization of contigs’, and then investigate every other approach with respect to that. Here we have the organization of contigs based on hierarchical clustering analysis, taxonomy from Centrifuge per contig (which is independent of the organization of contigs so it is a very good validation to see whether the organization makes sense), and results from the original publication from Sharon et al., in which authors did a very careful job to identify every genome in the dataset, including resolving the Staphylococcus pangenome (which is extremely hard for automatic binning approaches to resolve with one co-assembly). So these are the things we will assume “true enough” to build upon. To compare binning results, we could import each collection into the profile database the way we imported CONCOCT. But unfortunately at any given time there could only be one collection that can be displayed in the interface. Luckily there are other things we can do. 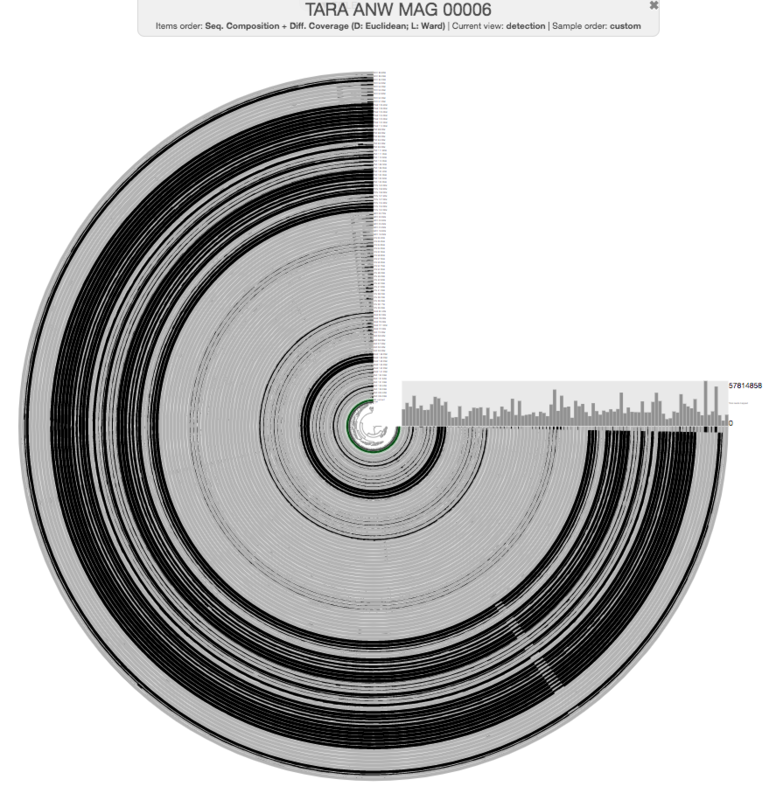 For instance, as a workaround, we can merge all binning results into a single file, and use that file as an ‘additional data file’ to visualize them in the interactive interface. Now we can discuss about the efficacy of different approaches. You can learn more about anvi-summarize here. All previous interactive displays were at the contig-level (each leaf in the center tree was a contig). However, this display is at the bin-level. 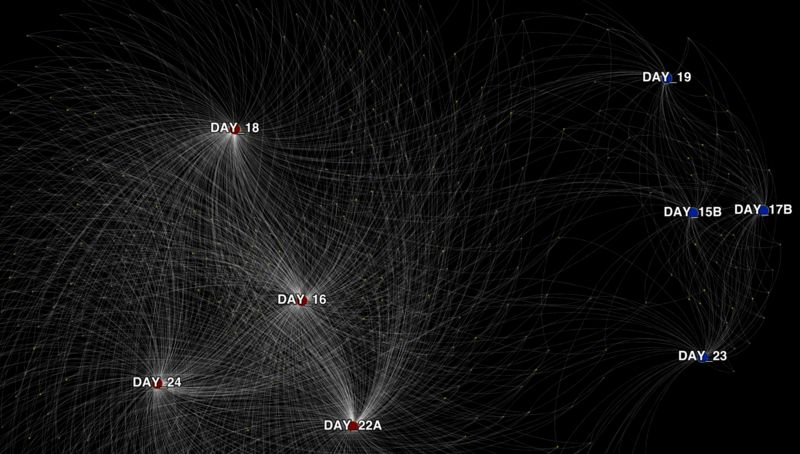 Instead of contigs, this display shows us the distribution of bins MaxBin identified. We also have completion and redundancy estimates for each bin, which helps us make some early sense of what is going on. It is clear that some bins are not as well-resolved as others. 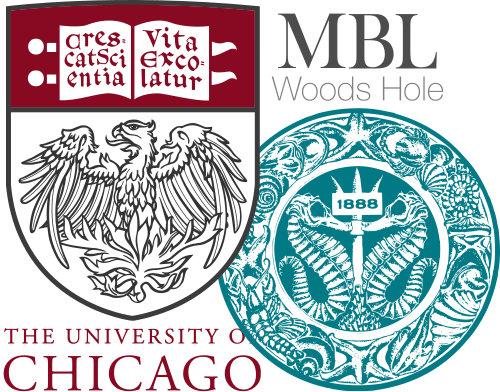 For instance, bins maxbin_007 and maxbin_008 have redundancy estimates of 22% and 91%, respectively, which suggests each of them describe multiple groups of organisms. Well, clearly we would have preferred those bins to behave. 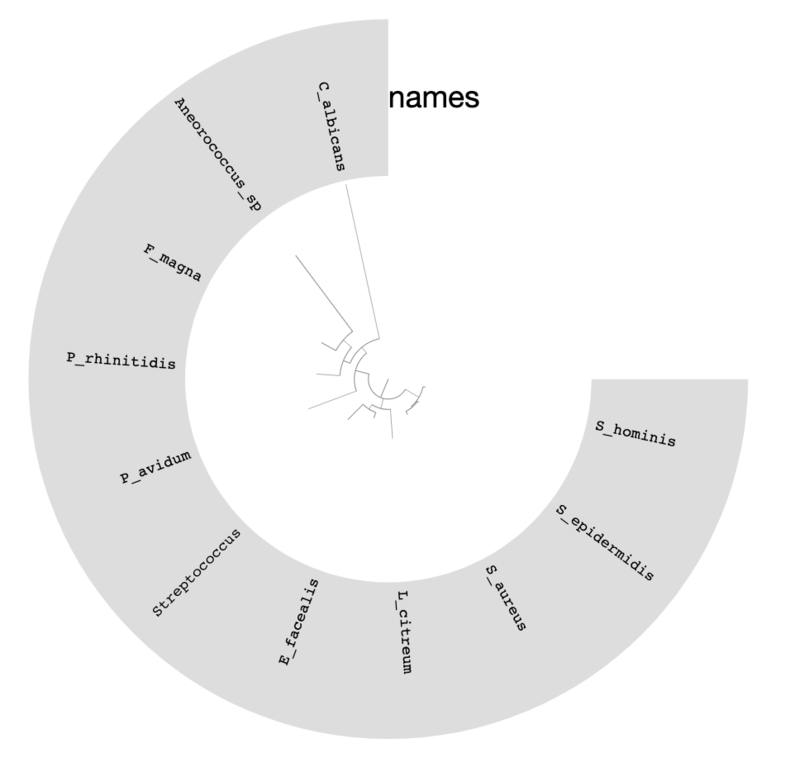 Here we see the distribution of each contig originally binned into maxbin_008 across samples. The hierarchical clustering did pick up some trends, and you can see there are more than one cluster you can identify somewhat easily. Let’s do the same for Bin maxbin_007 now. Once you are satisfied with your curation of the two contaminated bins, you can store new selections to the database from the Bins tab, and kill the server once you see the confirmation on the top-right part of the window. things will look much better. 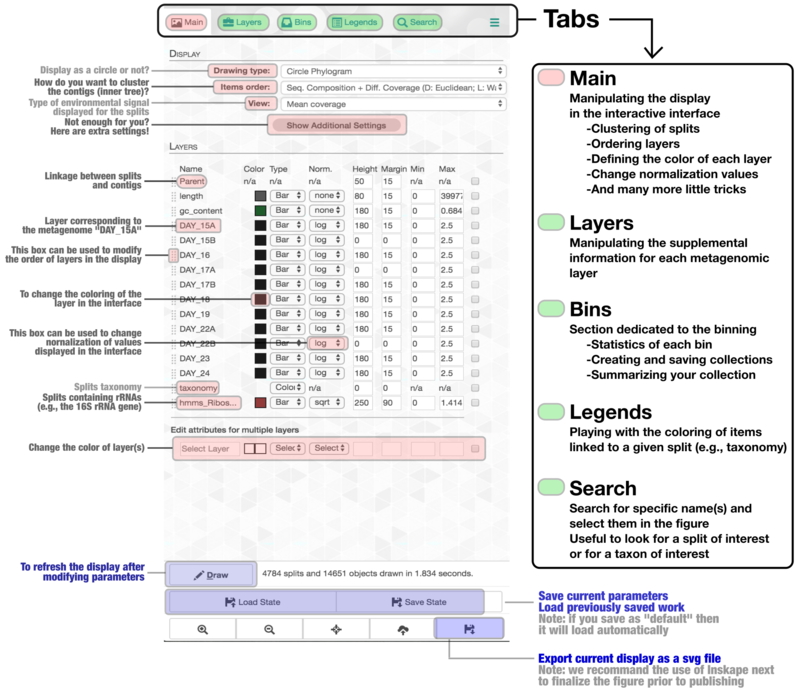 By investigating the Legends tab you can see that the source layer indicates which of the bins has been generated with anvi-refine. As you can see, even if the initial results from an automatic binning approach contain poorly identified bins, it is possible to improve the final results through refinement steps. You can read more about anvi-refine here. 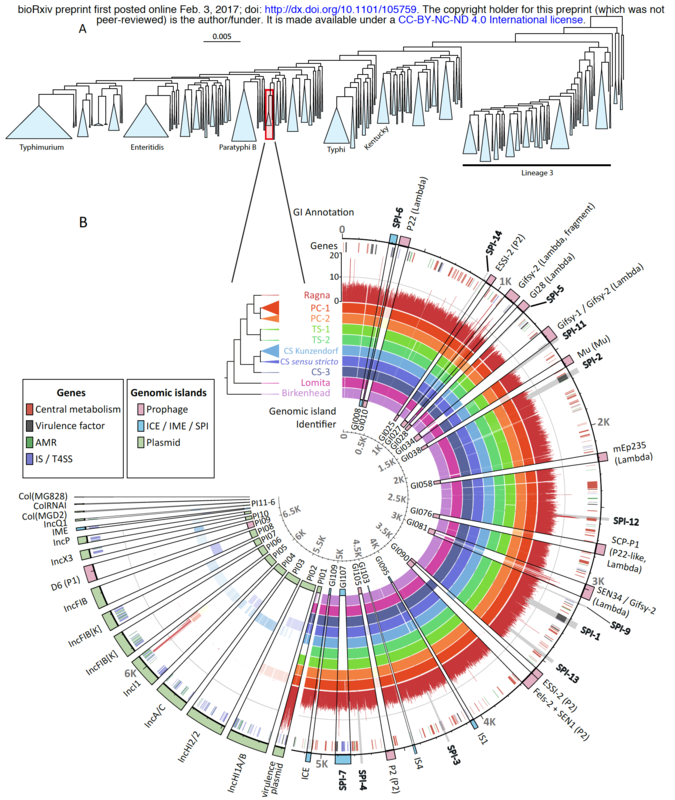 Also you may want to look at Tom’s refining of the Loki archaea: Inspecting the genomic link between Archaea and Eukaryota. If you are feeling lazy, you can just take a quick look at this videos from the post above. You should always double-check your metagenome-assembled genomes. Thank you for following the tutorial this far! Binning is inherently a very challenging task. In most cases it is absolutely doable, especially when there is a decent assembly, but it is very challenging. The IGD is one of the most friendly metagenomic datasets available to play with (since an astonishing fraction of nucleotides map back to the assembly), and it comes from a well-implemented experimental design (because that’s what Banfield group does). Yet, you now have seen the extent of disagreement between multiple binning approaches even for this dataset. You should reming yourself that each of these approaches are implemented by people who are well-trained scientists working with groups of people who are experts in their fields. These tools are benchmarked against others and showed improvements. So each one of them provides the best result compared to all others in at least one metagenomic dataset. I think understanding what this means is important. There is no silver bullet in the common bioinformatics toolkit that will take care of every dataset when you fire it. In fact, depending on the dataset, even the best tools we have may be as efficient as sticks and stones against the Death Star. Computational people are working very hard to improve things, but they would be the first ones to suggest that their tools should never make users feel free from the fact that it is their own responsibility to make sure the results are meaningful and appropriate. So which one to choose? How to get out of this situation easily and move on? I know how much desire there is to outsource everything we do to fully automated computational solutions. I also acknowledge that the ability to do that is important to perform large-scale and reproducible analyses without going through too much pain. But we are not at a stage yet with metagenomics where you can rely on any of the available automated binning tools, and expect your MAGs to be safe and sound. For instance, I think CONCOCT is doing a pretty awesome job identifying MAGs in the IGD, even with the low-abundance organisms. However, it is not perfect, either. In fact if you look carefully, you can see that it creates two bins for one Candida albicans genome. Hierarchical clustering will always get you closest to the best organization of contigs with simple distance metrics and linkage algorithms. But there are major challenges associated with that approach, including the fact that it is simply an exploratory method and can’t give you “bins” out-of-the-box. Even more importantly, it has tremendous limitations come from its computational complexity (~O(m2 log m), where m is the number of data points). So in most cases it is not even a remote possibility to organize contigs using a hierarchical clustering approach in an assembly in reasonable amount of time (and there is no way to visualize that even if you were to get a dendrogram for 200,000 contigs (you can create simple 2D ordinations with that number of items, but you really shouldn’t, but that’s another discussion)). Except assemblies with rather smaller number of contigs like the IGD, we are always going to use automated ways to identify bins, at least initially, knowing that resulting bins may be, and in most cases will be, crappy. That’s why in anvi’o we implemented ways to quickly look into automatically identified bins (i.e., the collection mode of anvi-interactive), and even refine those with poor redundancy scores to improve final results (i.e., anvi-refine). This is a problem that likely happens quite often, and very hard to deal with once the bins are identified. But we can recover from that. One of the heuristics we recently started using in our lab to avoid fragmentation error is to confine CONCOCT’s clustering space to a much smaller number of clusters than the expected number of bacterial genomes in a given dataset, and then curate resulting contaminated bins manually. Let’s say we expect to find n bacterial genomes, so we run CONCOCT with a maximum number of clusters of about n/2 (no judging! I told you it was a heuristic!). Well, how do you even know how many bacterial genomes you should expect to find in a metagenome? We have a citable version, and a more formal description of this workflow in our recent paper “Identifying contamination with advanced visualization and analysis practices: metagenomic approaches for eukaryotic genome assemblies” (see the supplementary material). There are more ways to improve bins and binning results. But although we have seen major improvements in our research by exploring these directions, there are also many other cases nothing is quite enough. Then it is time to increase the depth of sequencing, implement a different assembly strategy, rethink the sampling strategy, or change the experimental approach to do what seems to be undoable. Here is an example from Tom Delmont et al. to that last point with soil metagenomics: doi:10.3389/fmicb.2015.00358. We all just have to continue working, and enjoy this revolution. 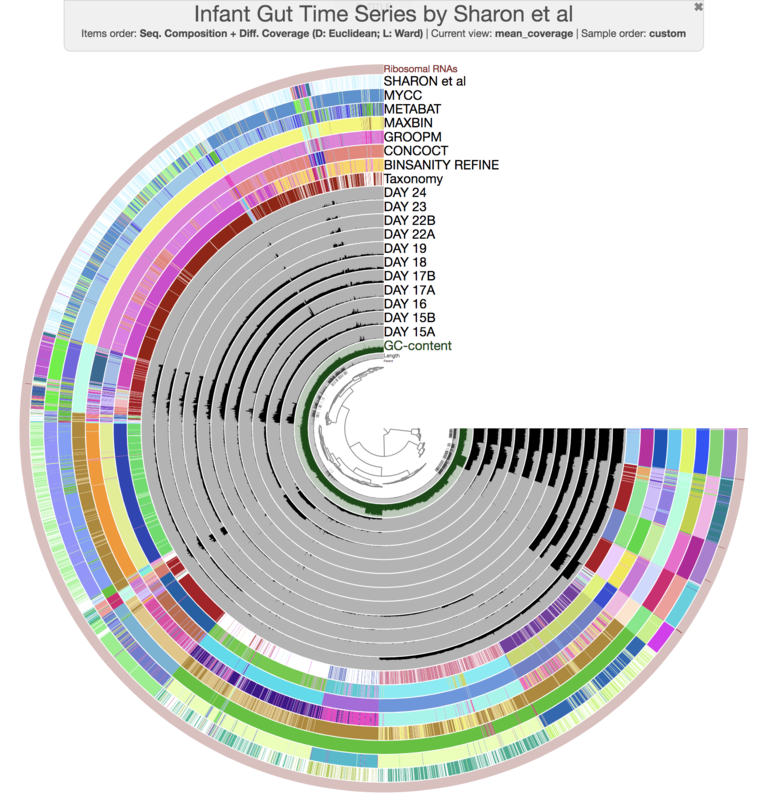 This is more of a practical tutorial to do phylogenomic analyses on metagenome-assembled genomes described in anvi’o collections. For a more abstract tutorial on phylogenomics, please consider first reading ‘An anvi’o workflow for phylogenomics’. If you haven’t followed the previous sections of the tutorial, you will need the anvi’o merged profile database and the anvi’o contigs database for the IGD available to you. Before you continue, please click here, do everything mentioned there, and come back right here to continue following the tutorial from the next line when you read the directive go back. 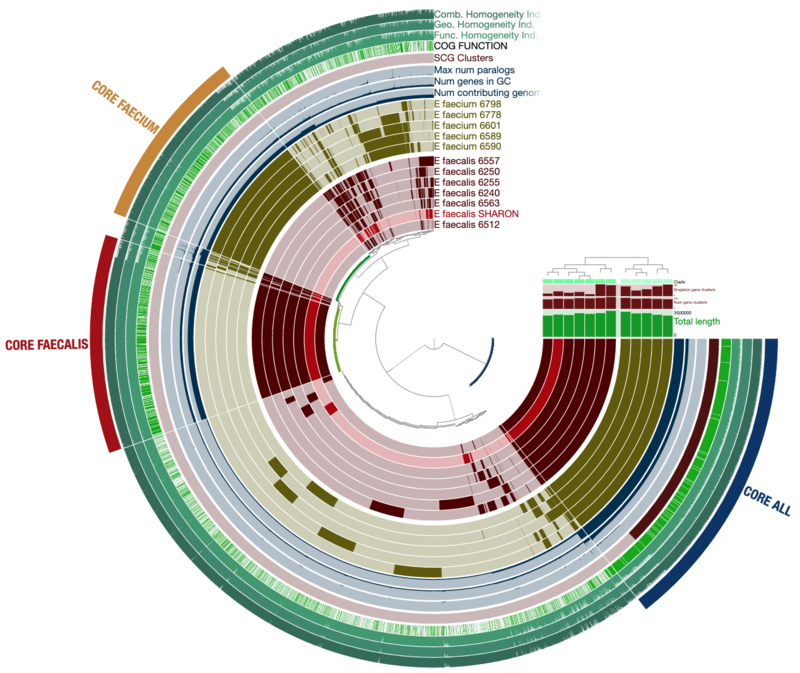 Putting genomes in a phylogenomic context is one of the common ways to compare them to each other. The common practice is to concatenate aligned sequences of single-copy core genes for each genome of interest, and generate a phylogenomic tree by analyzing the resulting alignment. Let’s assume we want to run a phylogenomic analysis on all genome bins we have in the collection merens in the IGD (you may have your own collections somewhere, that is fine too). In order to do the phylogenomic analysis, we will need a FASTA file of concatenated genes. And to get that FASTA file out of our anvi’o databases, we will primarily use the program anvi-get-sequences-for-hmm-hits. We first need to identify an HMM profile, and then select some gene names from this profile to play with. As you know, you can use anvi-run-hmms program with custom made HMM profiles to add your own HMMs into the contigs database. OK. A lot. Good for you, Campbell et al. For the sake of this simple example, let’s assume we want to use a bunch of ribosomal genes for our phylogenomic analysis: Ribosomal_L1, Ribosomal_L2, Ribosomal_L3, Ribosomal_L4, Ribosomal_L5, Ribosomal_L6. To exit less mode, press q. Every sequence for every HMM hit is for itself :/ Hmm. Concatenated we stand divided we fall. Although you can see how and why the previous output could be very useful for many other purposes, it is kinda useless for a phylogenomic analysis since we need a single concatenated alignment of gene sequences per genome. Well. That didn’t go well. If you take a look at the output file, you can see that we are getting somewhere. But the output is in DNA alphabet, which may not be the best option for phylogenomic analyses, especially if the genomes you have are coming from distant clades (which happens to be the case for IGD). Fortunately, you can easily switch to AA alphabet with an additional flag --get-aa-sequences (and no, there is no end to anvi’o flags, and the earlier you start getting used to the idea of reading those help menus, the sooner you will master your anvi’o game). If you look at the resulting file again, you will see how everything looks just so lovely. Congratulations. You did it. Once you have your concatenated genes, which you now have them in seqs-for-phylogenomics.fa if you followed the previous section, it is time to perform the phylogenomic analysis. There are multiple ways to do this. Here we will use the program anvi-gen-phylogenomic-tree, which accepts a FASTA file and uses one of the programs it knows about to compute the tree. Currently the only option is FastTree, which infers approximately-maximum-likelihood phylogenetic trees from FASTA files that look like yours. Send us your favorite, and we will happily consider expanding the collection of available tools for this analysis. If anvi’o complains that you don’t have FastTree, you need to do two things. First, feel ashamed. Second, get FastTree: click me. (If you are using a mac and have brew, quietly type brew install fasttree and pretend it never happened). 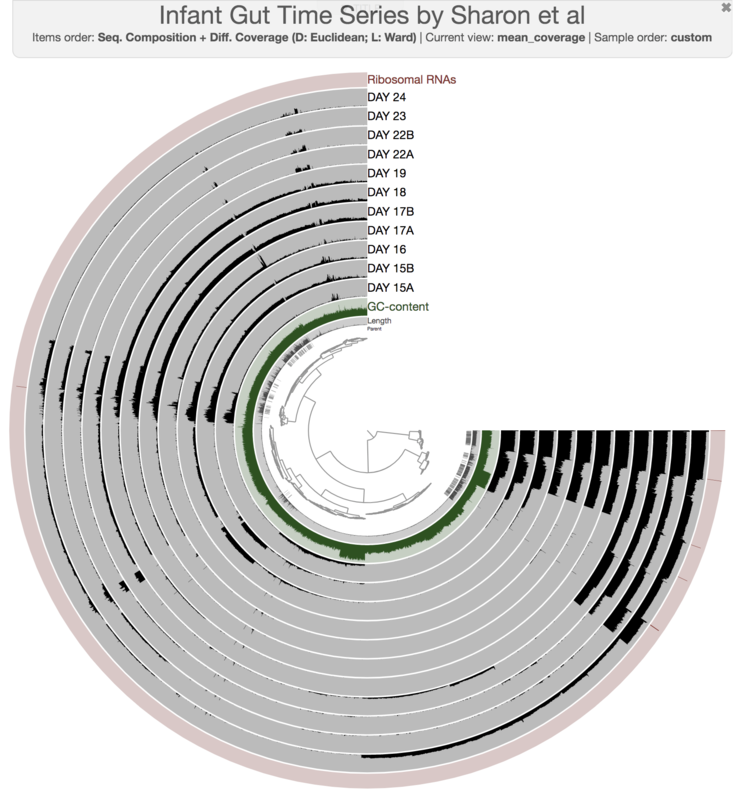 We can do much more with this phylogenomic tree of our bins than visualizing it in manual mode. For instance, we could use it immediately to organize our bins in our collection while showing their distribution across samples. 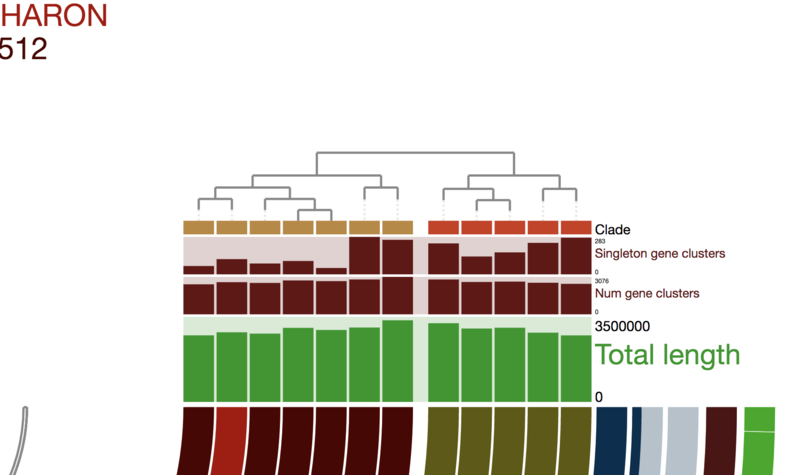 Which would give you the following display after selecting the ‘Phylogenomic tree’ from the ‘orders’ combo box in the ‘Settings’ tab. 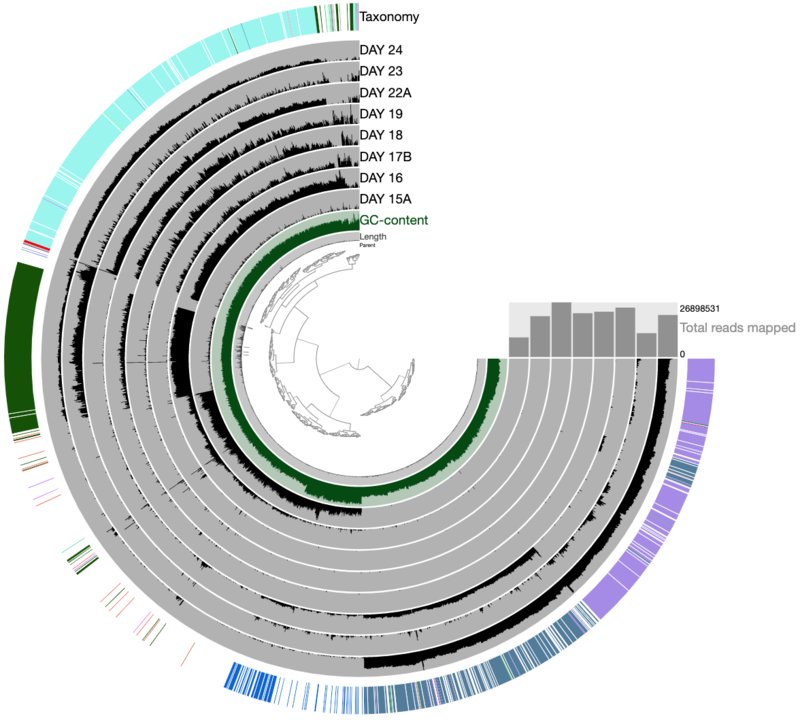 The tree in the middle shows the phylogenomic organization of bins we identified in the IGD. 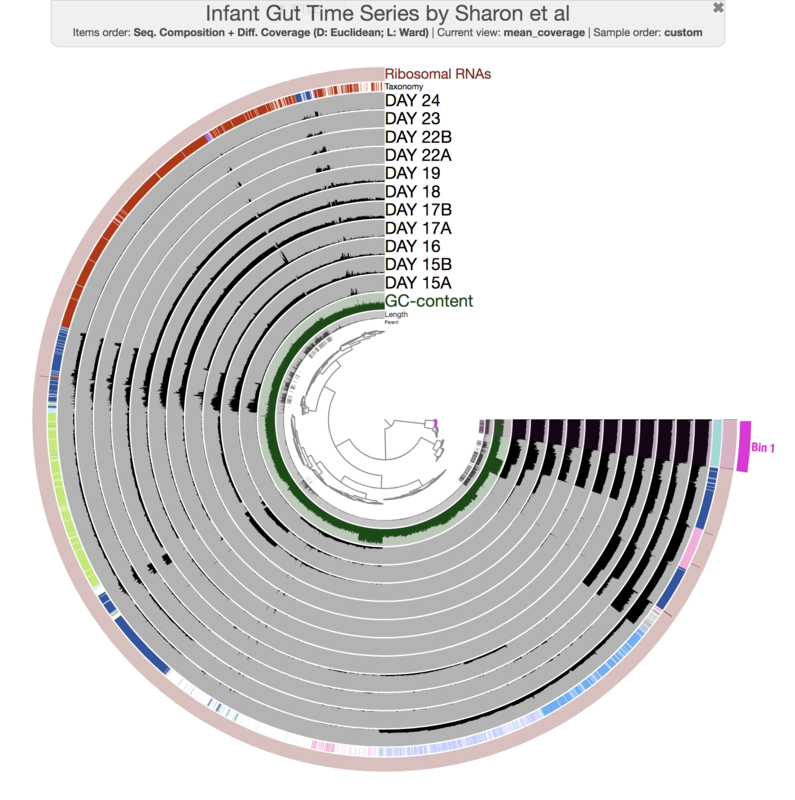 Here we will profile the single-nucleotide variations (SNVs) in the E. faecalis bin found in Sharon et al.’s Infant Gut Dataset (IGD). This is more of a practical tutorial for hands on experience to recover and make sense of SNVs. For a more theoretical one on the same topic, please consider first reading the tutorial Analyzing sequence variants with anvi’o. If you haven’t followed the previous sections of the tutorial, you will need the anvi’o merged profile database and the anvi’o contigs database for the IGD available to you. Before you continue, please click here, do everything mentioned there and come back right here to continue following the tutorial from the next line when you read the directive go back. OK. Let’s first remind ourselves where this bin is. The red selection in the most outer layer represents the E. faecalis bin, which is very abundant in every sample, and it is stored in the collection merens under the bin name E_facealis (yes, the name has a typo, we know, it is all Tom’s fault). In this section we will focus on this bin, and in fact we don’t really need the rest of this metagenome. Domain for single-copy core genes; C: Domain confidence. Why anvi-split is great for open science? In a recent large-scale study we discovered very abundant, yet previously unrecognized microbial populations in the surface ocean that have the capacity to ‘fix’ nitrogen. Here is the study, and here is the behind the paper blog post. We did the scariest of all in the name of open science by making sure anyone could ‘see’ what is going on in our genome bins with as little effort as possible. Yep. Because it 2018. That’s why. See, it really is abundant (every dot here is the coverage of a nucleotide position that was reported as a variable position). OK. Clearly, we have no way of knowing the extent of variation within this bin through this perspective. But anvi-gen-variability-profile is exactly for that purpose, and that’s what we will do here using two different methods to visualize its report (using R, and using anvi’o). which contains only the sample names with larger number of reads for every duplicate day to simplify things. OK. Our beloved anvi-gen-variability-profile will kindly store results from 466 nucleotide positions in the output file, E-faecalis-SNVs.txt. Because we used the flag --quince-mode, there will be a total of 3,728 entries in the file (=466 x 8). At this point we now know that the E. faecalis is not a monoclonal bin, and does maintain some level of heterogeneity. What we don’t know is whether it is just noise, or if there is any signal that may tell us something about the nature of this variability. Now we will visualize the information two different ways. This R script will require some libraries to be installed. You can install all of them by typing R in your terminal, and then entering this command: install.packages(c('ggplot2', 'reshape2', 'reshape', 'gridExtra', 'grid', 'plyr', 'gtools')). After everything installs, exit R by typing q(). My R version that worked with this script was v3.2.2. The figure displays for the E. faecalis bin in each sample (from top to bottom), (1) average coverage values for all splits, (2) variation density (number of variable positions reported during the profiling step per kilo base pairs), (3) heatmap of variable nucleotide positions, (4) ratio of variable nucleotide identities, and finally (5) the ratio of transitions (mutations that occur from A to G, or T to C, and vice versa) versus transversions. In the heatmap, each row represents a unique variable nucleotide position, where the color of each tile represents the nucleotide identity, and the shade of each tile represents the square root-normalized ratio of the most frequent two bases at that position (i.e., the more variation in a nucleotide position, the less pale the tile is). 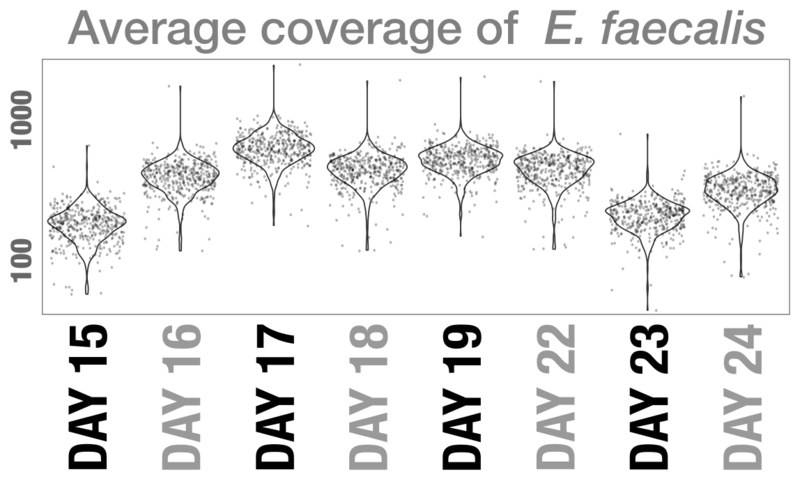 The figure shows that the variation density changes quite dramatically from one day to another, despite the rather stable coverage. Plus, the emergence of this pattern is not random: the heatmap shows that the nucleotide positions that show variation re-occur, and competing base identities remains the same. Investigating what causes this, is of course when things start to get exciting. However, we will not go there. Instead, we would like to leave you with this thought: by using patterns of variability, we can start characterizing changes in microbial population structures across environments, and generate better-informed hypotheses to investigate mechanisms that drive these shifts. R visualization is useful, but the heatmap in that figure can’t effectively visualize more than a couple hundred positions. That’s why there is a random subsampling step. But we can use the anvi’o interactive interface to display up to 25,000 nucleotide positions easily. For this, we have a little program called anvi-script-snvs-to-interactive which reads an anvi’o variability profile, and creates an anvi’o interactive interface-compatible output from it. it will do its magic, and create an output directory with material that can directly be used with anvi-interactive with the --manual flag. A little note for people who are interested in programming: Feel free to take a look at the relevant line of the source code of this script to see how easy it is to generate an anvi’o-compatible visualizable output from any TAB-delimited matrix file. There are many directions you can go once you have the gene caller IDs associated with a question you have. Just take a look at this post and see some of the hidden talents of anvi’o: Musings over a Nitrospira genome that can do complete nitrification. Here I will stop, but still we have a lot to talk about! You can use Gephi to play with the resulting file to visualize or to analyze the network properties of nucleotide positions further. You just read about three different ways to visualize the single-nucleotide variability profiles. We are done here! 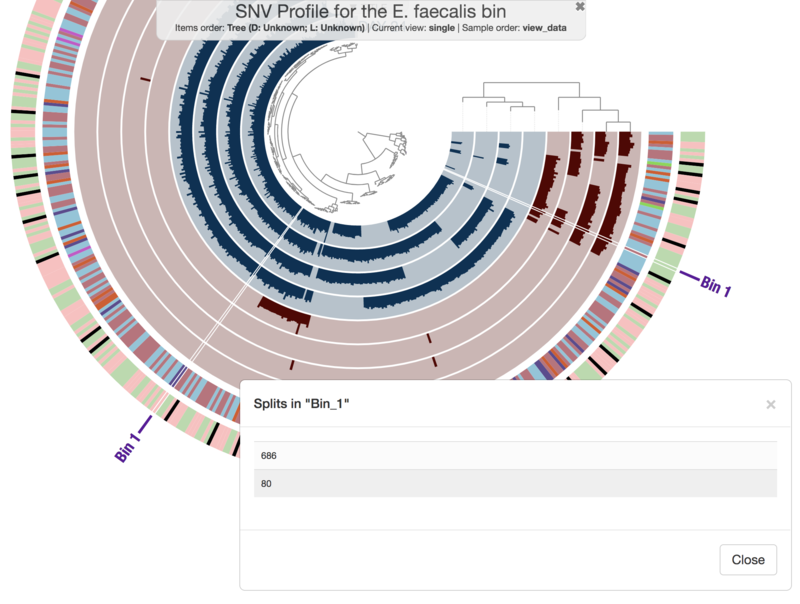 You can use anvi’o to perform comparative genomics and here we will have a small pangenomic analysis using our famous E. faecalis bin we recovered from the infant gut dataset. You can find a comprehensive tutorial on the anvi’o pangenomic workflow here. It is this simple to combine MAGs and isolates. So everything is ready for an analysis, and the first step in the pangenomic workflow is to generate an anvi’o genomes storage. 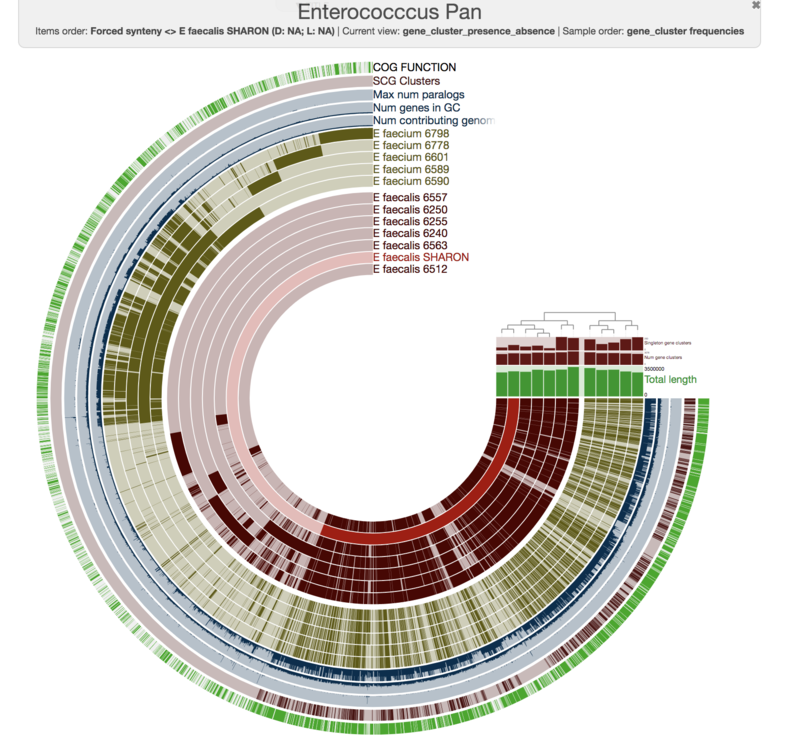 This is a pangenomic analysis visualized with anvi’o by Zhemin Zhou and his colleagues. 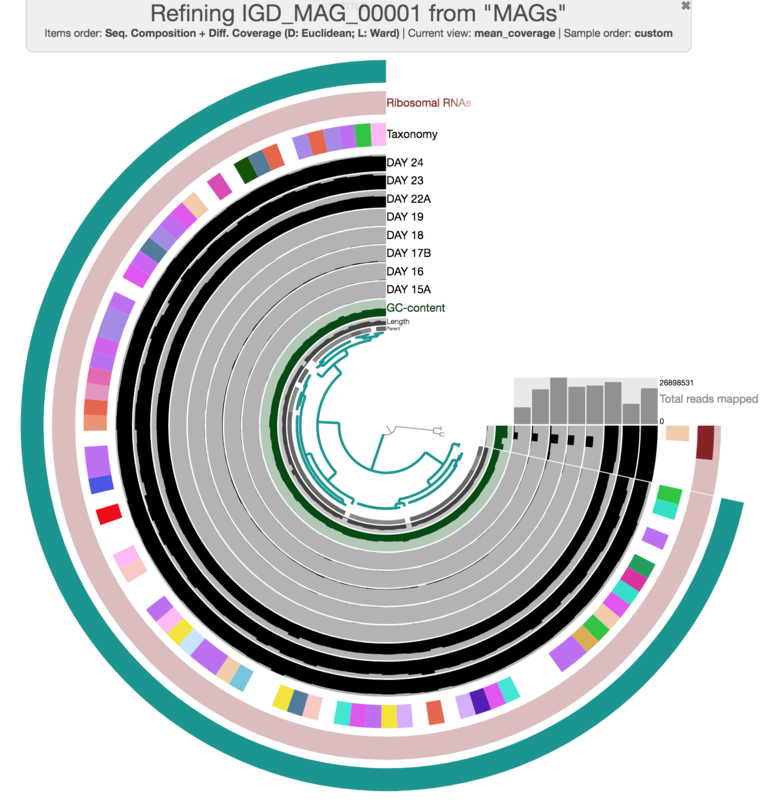 Here is more information about this excellent study: An 800-years-old Salmonella genome, and a lovely anvi’o figure. I am not arguing that every figure should look like that one, but I would like you to consider the fact that if you would like to do better, there are ways. Here is a post about working with SVG files anvi’o generate. 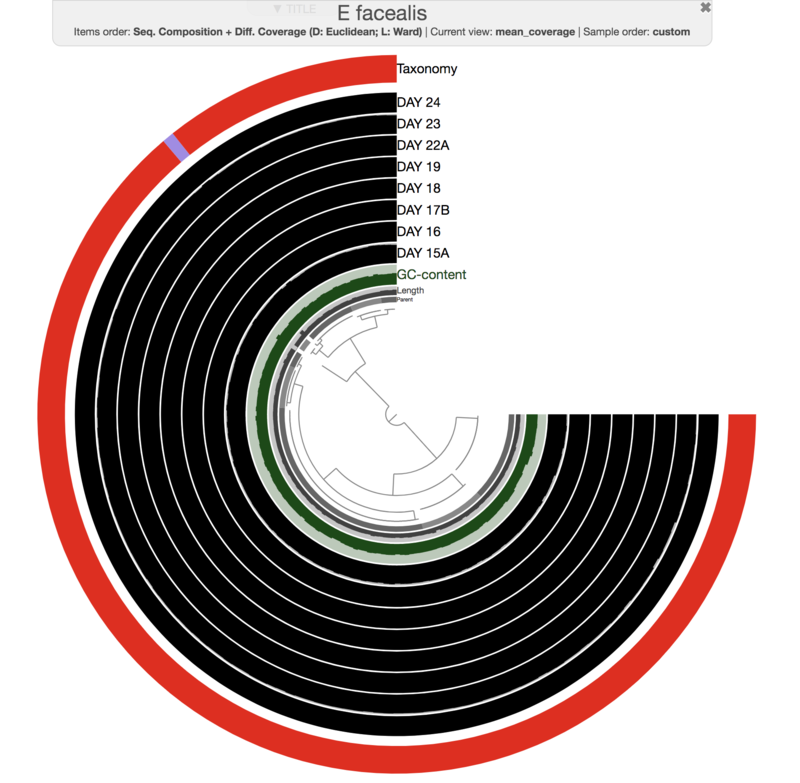 Now not only can we see how our E. faecalis genome looks like compared to available genomes, we can also see that it is not missing or carrying a great number of proteins compared to other genomes. 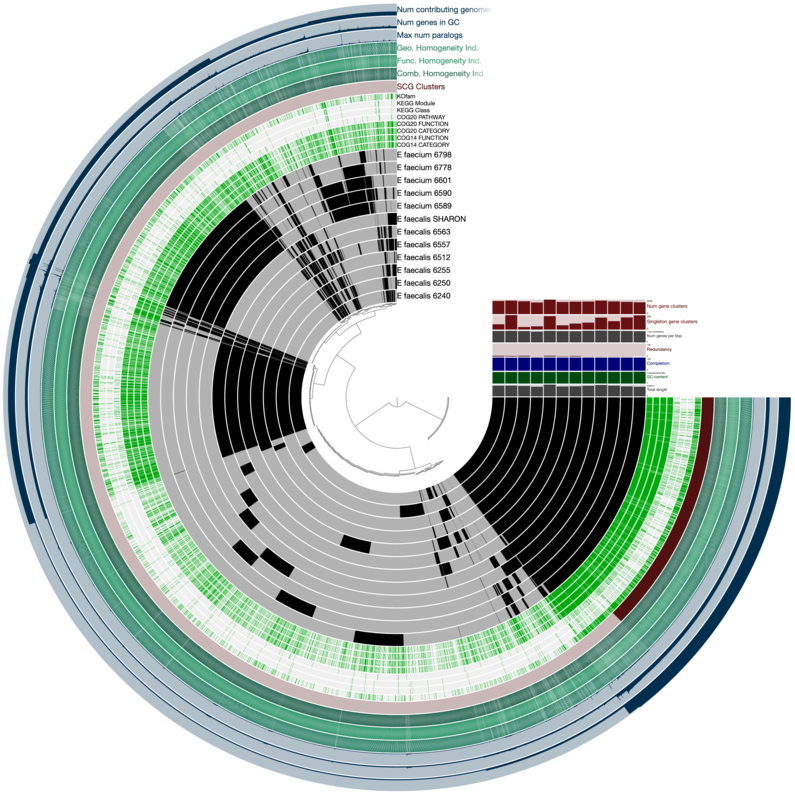 The clustering of genomes based on gene clusters indicate that it is most similar to the genome Enterococcus faecalis 6512, which, according to the 00_INFO_ABOUT_EXTERNAL_GENOMES.txt under additional-files/pangenomics/external-genomes directory, corresponds to the assembly ID ASM17257v2 if you were to be interested in exploring further. The pangenome tells us about the similarities and dissimilarities between those genomes given the amino acid sequences of open reading frames we identified within each one of them. We could also compare them to each other by computing the average nucleotide identity between them. Anvi’o comes with a program to do that, which uses PyANI by Pritchard et al. to pairwise align DNA sequences between genomes to estimate similarities between them. See this tutorial for details. One of the things we often are interested in is this question: which functions are associated with a particular organization of genomes due to their phylogenomic or pangenomic characteristics. For instance, genomes in this pangenome are organized into two distinct groups based on differential distribution of gene clusters. That is of course not surprising, since these genomes are classified into two distinct ‘species’ within the genus Enterococcus. So you can certainly imagine more appropriate or interesting examples where you may be wondering about functional enrichment across groups of genomes that do not have such clear distinctions at the level of taxonomy. The actual tutorial to make sense of functions in pangenomes is here. Here we will make a quick pass to demonstrate its relevance. We used collections to store bins of contigs in the first section (and that’s how we identified that E. faecalis population from the Sharon et al. metagenomes anyway), and now the same concept serves us as a way to store bins of gene clusters. Inspecting gene clusters can be a lot of fun and very depressing at the same time. But of course it is hard to get a comprehensive understanding by going through things one by one. But can we summarize the pangenome? For instance, in my tentative selection above, there is a bin called CORE ALL, which describes all gene clusters that seems to be in all genomes in this analysis. 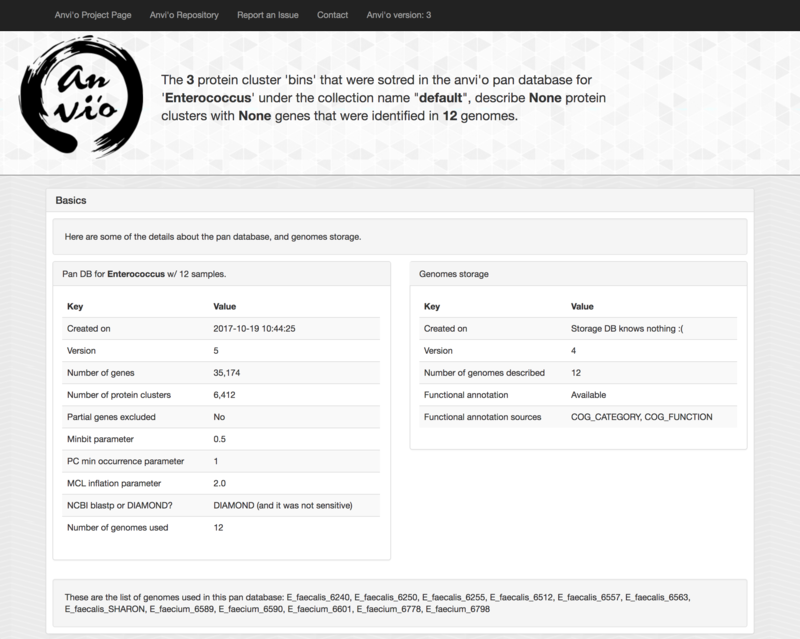 You can in fact summarize the collection default to access all the information about each gene described in each gene cluster selected as CORE ALL. I’m sure you need no help to know what to do with this file. 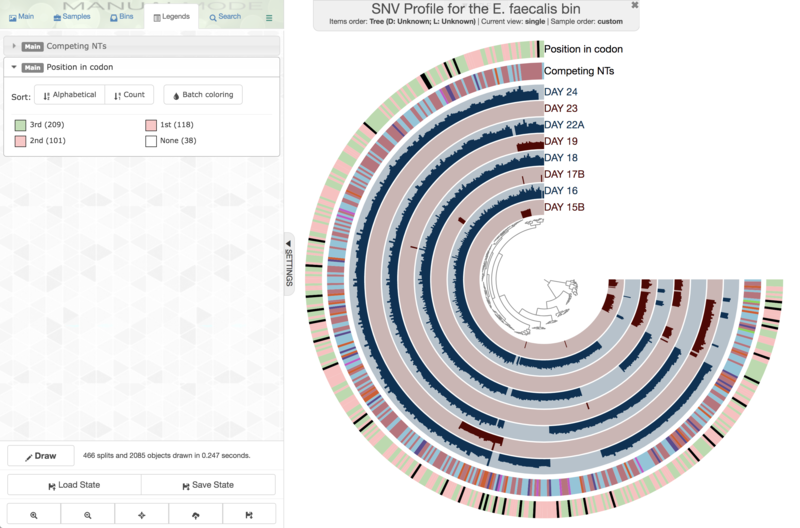 In the previous sections of this tutorial we recovered an E. faecalis genome from an infant gut metagenome. 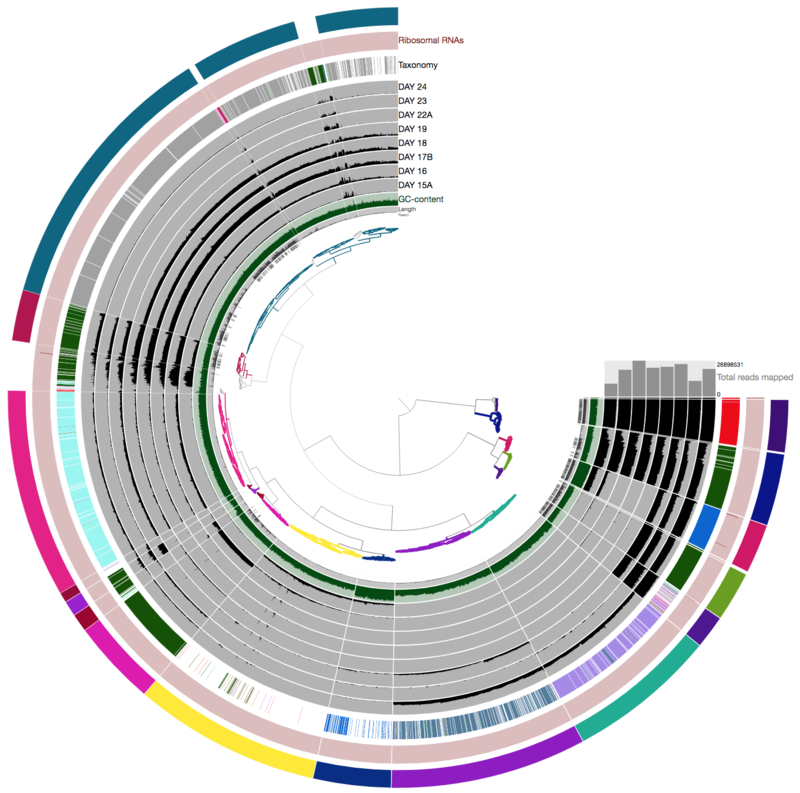 Increasing availability of shotgun metagenomes offer quite powerful ways to characterize MAGs and isolate genomes across different systems. 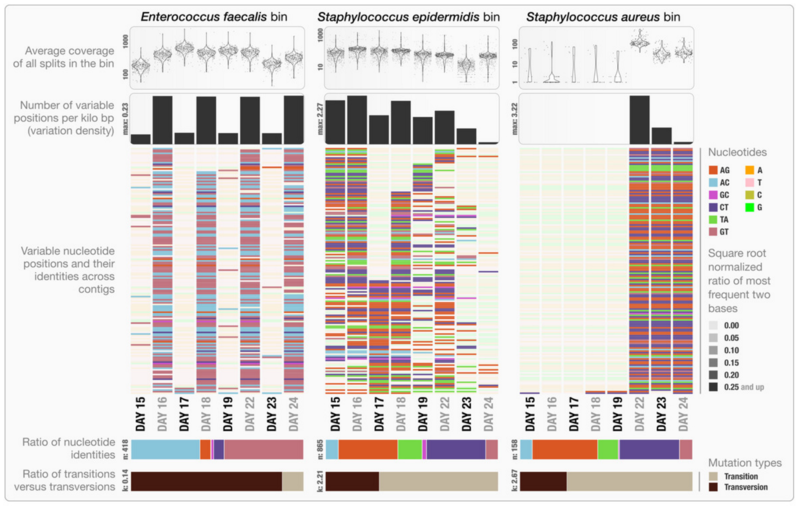 Harnessing the power of available metagenomes, in fact we could ask the question “how does our E. faecalis MAG look like in other infant gut metagenomes”. To provide a preliminary answer to this question, and how similar questions can be answered using in anvi’o, here we will use another Banfield group study by Brooks et al. 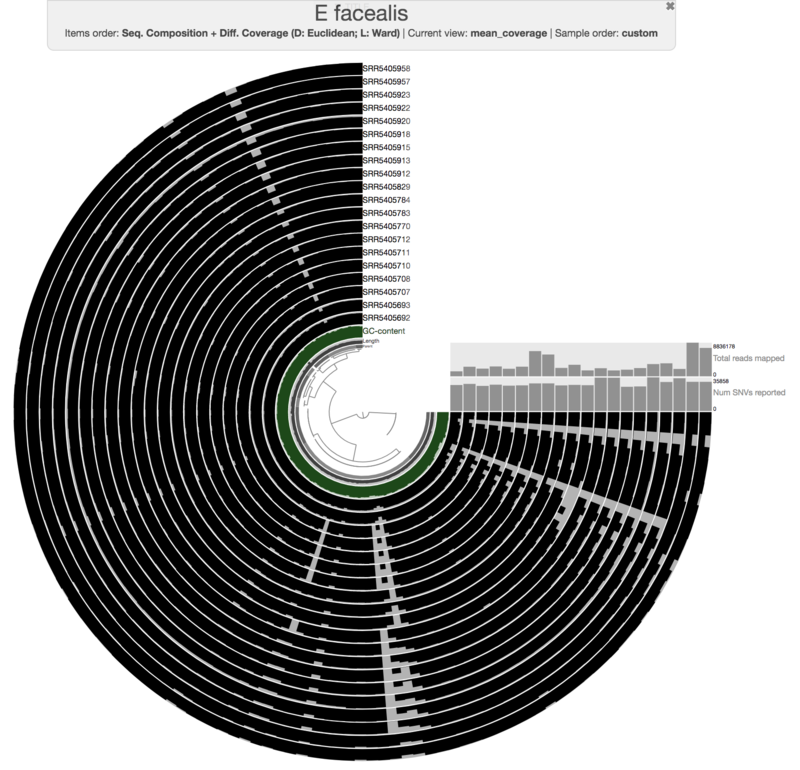 In your data pack you have a merged anvi’o profile that describes the read recruitment statistics of our E. faecalis MAG across 20 gut metagenomes from the Brooks et al. study. 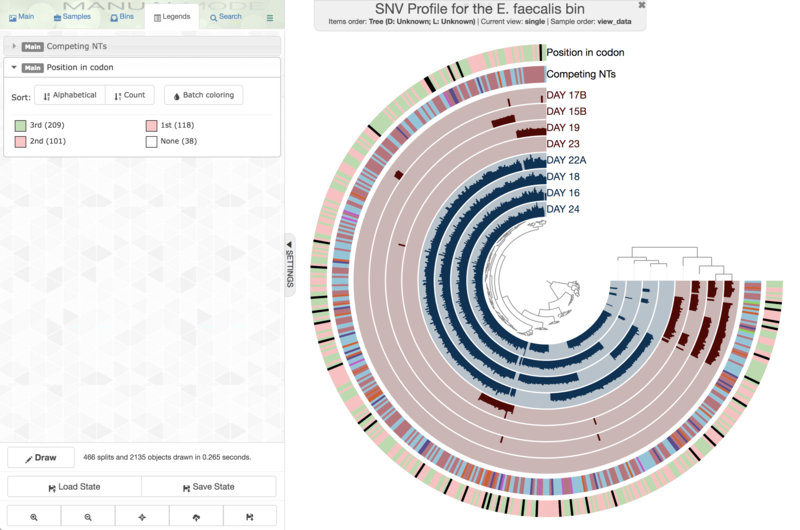 Snakemake workflows to the rescue Your datapack already contains an anvi’o contigs database and a merged profile database that puts the E. faecalis genome in the context of 20 gut metagenomes, but here is some extra info for those of you who are curious to know how did we generated these data. 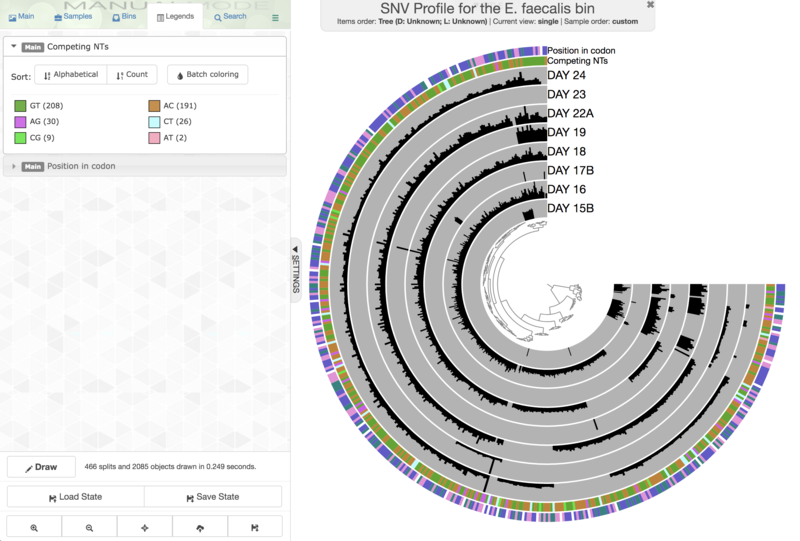 To generate these mapping results and to profile them using anvi’o, we used the anvi’o snakemake workflow for metagenomics. Please read this article for an extensive tutorial on anvi’o snakemake workflows. Which simply lists names and paths for 20 metagenomes we downloaded from the study above. 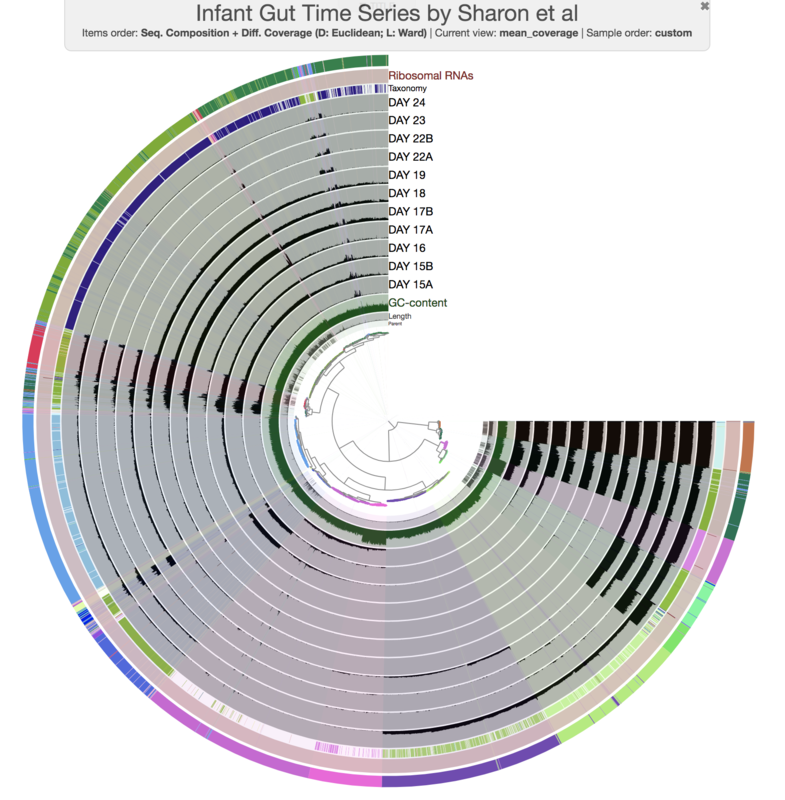 This output simply puts our contigs in the E. faecalis genome we recovered from Sharon et al.’s infant gut in the context of 20 other infant gut metagenomes. Furthermore, one could want to do it per gene basis for a more higly resolved understanding of distribution patterns. Luckily, if you have a collection and a bin in your profile database, anvi’o allows that. If you don’t have a collection, anvi-script-add-default-collection will help you add one. 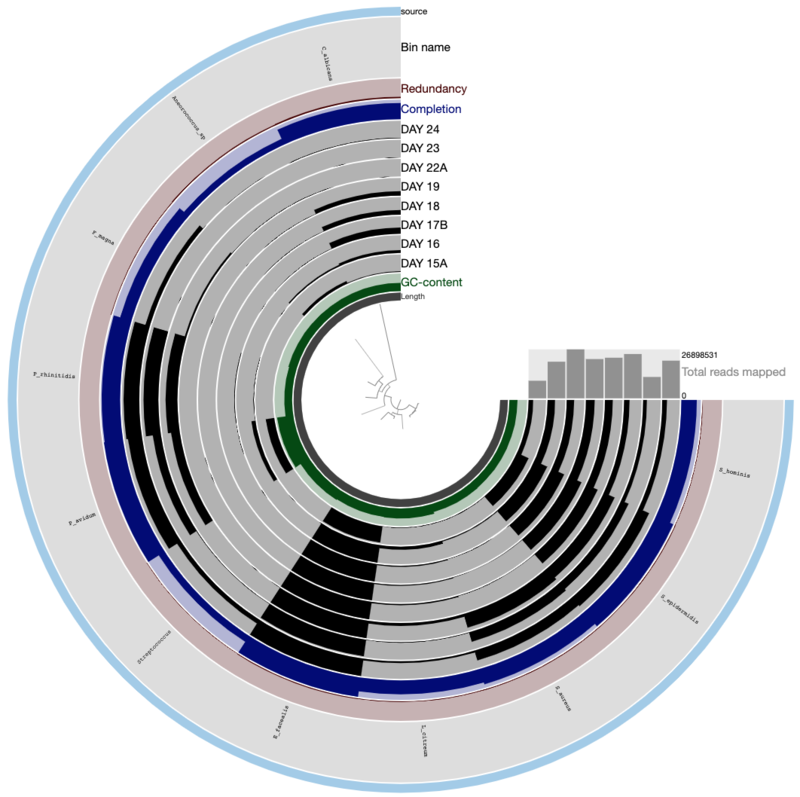 This section of the tutorial uses the data described in the above section Putting the E. faecalis genome in the context of HMP gut metagenomes. You already have this data, but if you’re wondering “where did this come from?”, you should read that section and then come back. In the previous sections of this tutorial we used single-nucleotide variants (SNVs) to explore sequence heterogeneity of an E. faecalis population. In this section of the tutorial we explore in what ways these variants alter the encoded protein synthesized downstream, and how such variation is shaped by principles of protein evolution. When analyzing sequence variation in the context of proteins, it makes a lot more sense to characterize sequence variation with single codon variants (SCVs) or single amino acid variants (SAAVS) rather than SNVs. If you are unfamiliar with these concepts, or want to learn more, click me. Evan’s disclaimer: It’s worth noting that this E. faecalis MAG recruits reads from populations with relatively low amounts of intra-population diversity. In more diverse microbial environments such as marine or soil ecosystems, visual patterns of variants on protein structures become much more striking. While the infant gut tutorial is a good medium to get you familiarized with various features of anvi’o, you should check out Figure 3 of this preprint if you want to see more striking patterns of structural sequence variation. 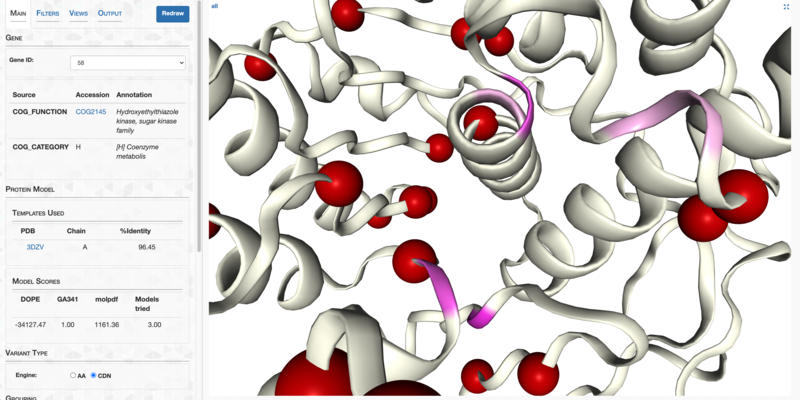 With a structure database in hand, you are ready to visualize SAAVs and SCVs on protein structures. After running the above command, you should see the following view. This is the predicted structure for gene 58. It’s a 4-methyl-5-(beta-hydroxyethyl)thiazole kinase, and the template protein used to model the structure was crystallized from an E. faecalis isolate by the Joint Center for Structural Genomics. The template shares 96.5% sequence identity with our gene, and so we are very confident in the accuracy of the predicted structure. 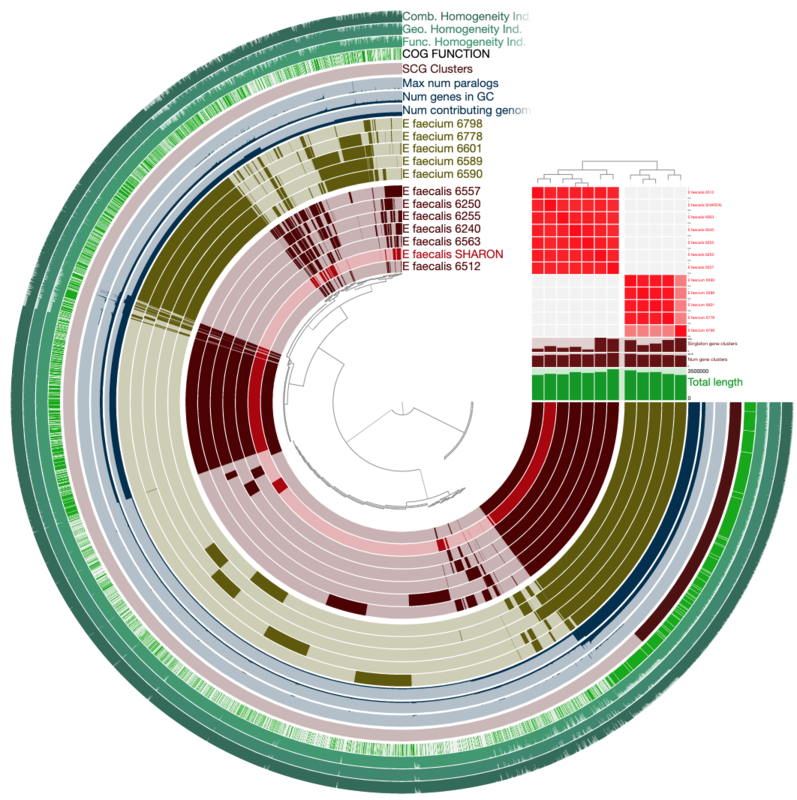 Each red sphere indicates the position of a SAAV that occurred in at least one of the metagenomes. You can learn more about each SAAV by hovering the mouse above it. The 4 white-ish spheres are sites in which the metagenomes disagree with the MAG, but where there is little to no variation within the environment. In contrast, the 3 red-ish spheres indicate sites in which the environment has a mixed population of 2 or more amino acids. Verify this for yourself by looking at the variant frequencies and comparing their identities to the reference residue. In the situation below, there exists both synonymous and non-synonymous transitions. Note that the synonymity correspondingly deviates from 1. If you inspect enough of these genes, you’ll start to notice that SCVs at solvent inaccessible residues (relative solvent accessibility = 0) are almost always entirely synonymous (synonymity = 1). Do you have any explanation for why? 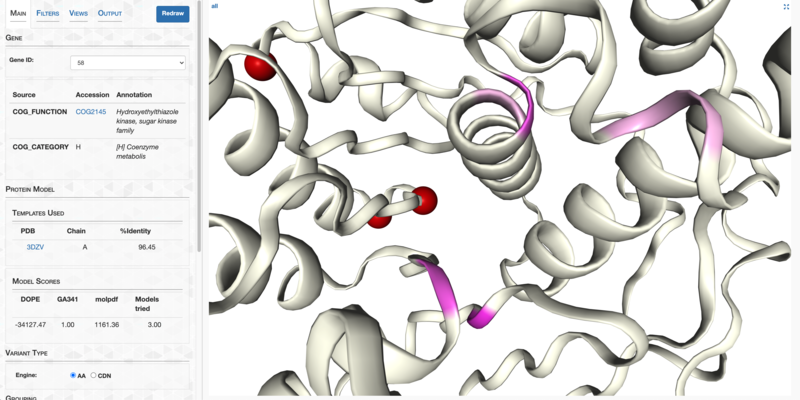 Since gene 58 is a kinase, it may not surprise you it has a binding pocket for ADP. 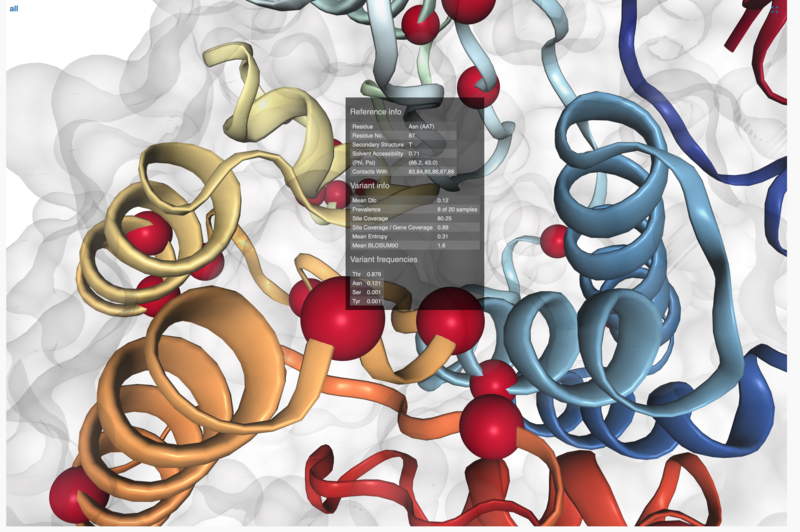 Unfortunately there is currently no way to visualize ligands, but we can get a sense for the binding pocket by adding a translucent surface to the protein in the Perspectives tab. The binding pocket is pointed out in the animation below, and if you are up for the challenge, you can try and find this pocket in your own interface. However, when we switch to a view of SCVs, the pocket lights up like a Christmas tree. Click here to investigate for yourself. Of these residues, G190, V191, and G120 are SCVs in the infant guts, which confirms that mutations are occuring in the region of DNA encoding the binding pocket. Hovering the mouse over of each of these 3 SCVs, you can verify that these residues have synonymity values of 1, which is to say they are completely synonymous sites. This is a fine example of how non-synonymous sequence evolution is usually more highly constrained than synonymous sequence evolution due to fitness-decreasing alterations in the biophysical properties of the encoded protein. Since these synonymous SCVs do not influence the binding site, they have no fitness effect on the protein’s ability to function. It’s impossible to know without conducting fitness experiments, but most likely they are neutral mutations, and have entered the population through drift and/or draft. Now, there are many more grouping categories available to us. cohort_infant categorizes metagenomes into the infants from which they were sampled. 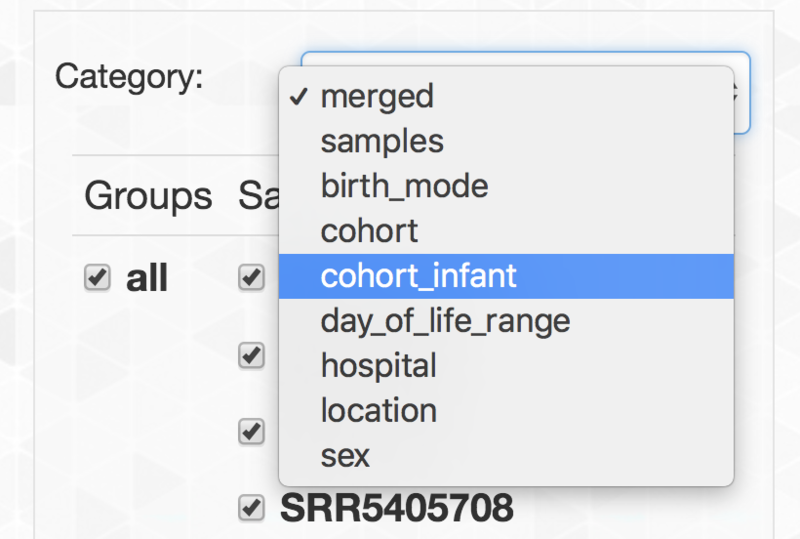 Select it to reveal one protein view for each of the 7 infants. Now the display can inform us about subtle differences in SAAVs between each infant. We hope this tutorial give you enough motivation to explore your own data with this framework! 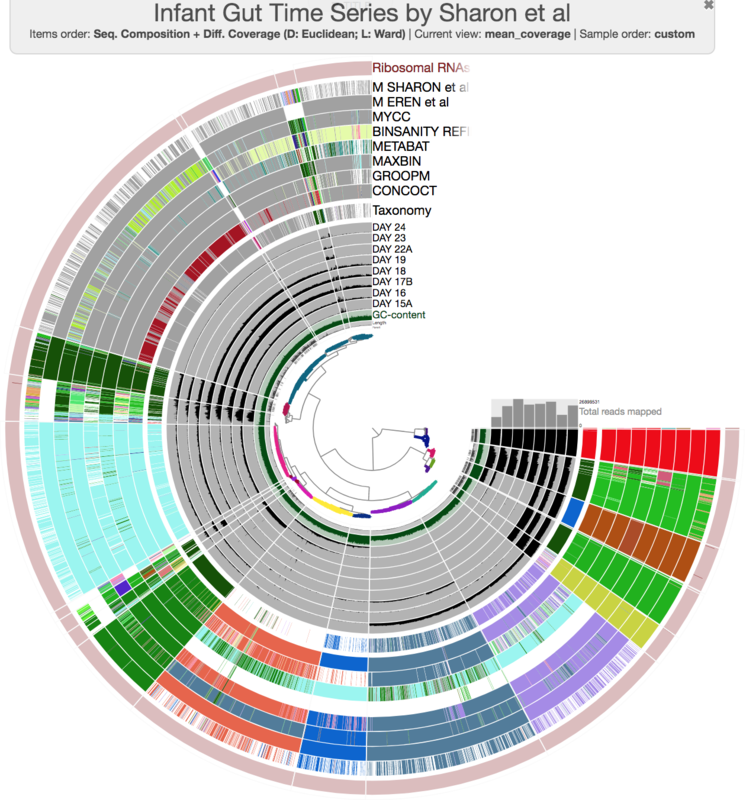 Feel free to click on the other 4 genes in the Main tab and further explore, or better yet, do it with your own metagenomes. Let’s face it: it is a lot easier to live in a world of A, C, T, and G. But in this restricted space we can’t explore the biochemical consequences of our sequences, and we therefore can’t understand why DNA sequences are the way they are. This branch of anvi’o has been designed to help make this undertaking more accessible, but it is only in its infancy. If you have suggestions, please let us know. Do you want more examples? Do you have questions? Please don’t hesitate to get in touch with us!